If you have a shared device and want to cover your tracks in Safari, here's what you need to do. Maybe you have been using the iPad you share with your wife to shop for an anniversary present. Maybe you are afraid your boyfriend will pick up your iPhone and see you've been looking at unsavory websites. There are plenty of good reasons to want to clear your Safari browsing history. On iPad and iPhone, it's very easy to do. If you don't want to wipe out your entire web browsing history, you can delete just the last hour, day, or two days. You can even selectively delete individual history records. 1. 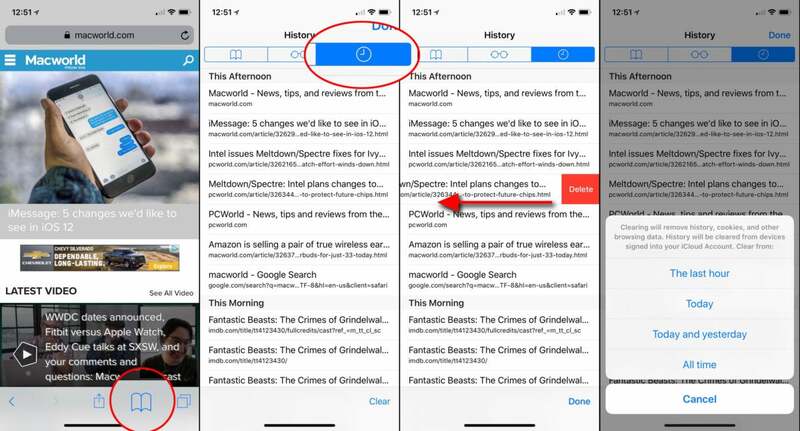 In Safari, tap the Bookmarks button at the bottom of the screen. (On iPad, it's in the upper left). 2. Then select the History tab at the top of the list to see your browsing history. 3. You can swipe left on any single history item to delete just that item. 4. Or, tap Clear at the bottom of the screen to be presented with four time periods to eras: The last hour, Today, Today and yesterday, or All time. Safari allows you to remove individual history items, or select from four different time periods. This is the best way to clear some of your browsing history without getting rid of everything. Note that if you sync browsing data with iCloud, this will affect your browsing history on all devices that use the same iCloud account. Want to get rid of everything: all your history, cookies, the works? You can jump into Settings to wipe out all traces of your Internet activity. 1. Open Settings, then scroll down and tap on Safari. 2. Scroll down to the Privacy and Security section and tap on Clear History and Website Data. 3. You'll get a pop-up warning you that you're about to clear all your website data. Tap Clear History and Website Data again. If you want to clear out everything, hop over to the Settings app. This is the best way to get rid of all traces of your internet activity in Safari on iOS. 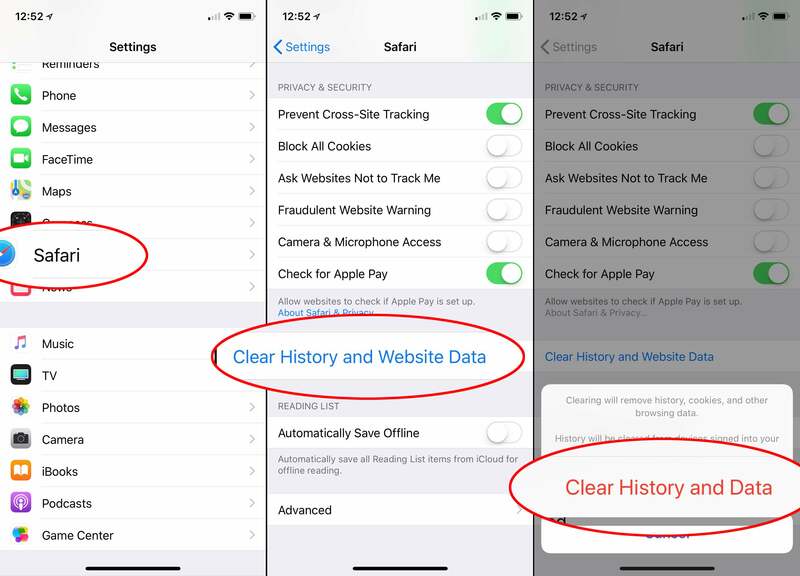 Note that your history will be erased from Safari on other devices logged into the same iCloud account, if you have iCloud sync enabled for Safari.